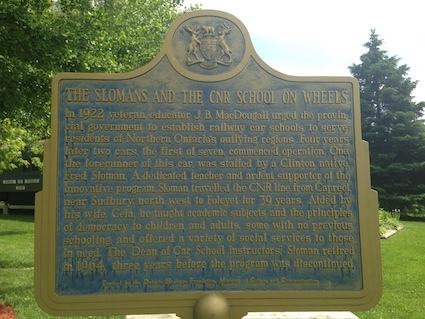 The School on Wheels Museum has a permanent home in Clinton, Ontario. 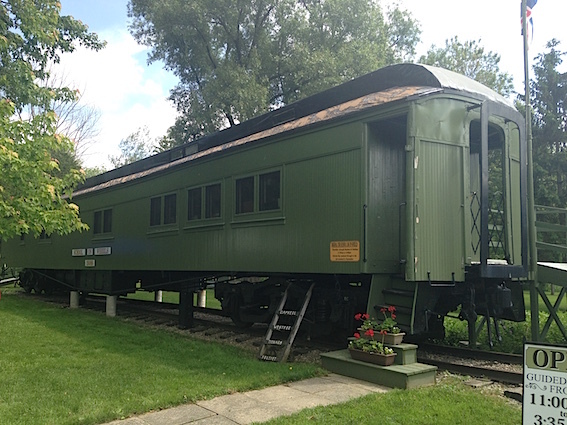 CLINTON – The School on Wheels Museum in Clinton has long been on my list of places to visit. Last Saturday I got my chance and had not only a guided tour but also enjoyed Tea with Toby as well as well over an hour’s one-on-one time with the delightful Toby Sloman Rainey. 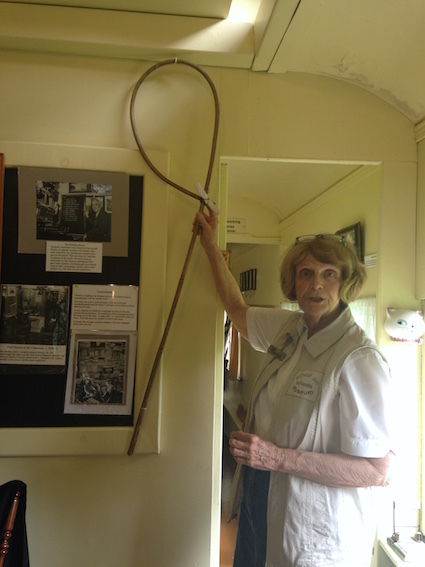 Museum staff, Carolyn Brophy, shows me one mode of communication implemented by the Sloman’s on the train. A note would be attached to this switch that would be grabbed by someone on a passing train. It may be a simple grocery list. The switch was dropped on the ground and one of the students would run down the track to retrieve it. Then, on a return train, the product(s) would be delivered. Standing in Sloman Memorial Park is the original 100-year-old wooden train car that the Sloman’s lived in for most of the 39 years that Toby’s father, Fred, brought an education to the children living in isolated areas of Northern Ontario. Toby is the youngest daughter of Fred and Cela Sloman. At 77 she’s spunky and committed to creating a lasting tribute to her family’s heritage. Toby shared plans to hopefully one day build an interpretive centre on the grounds and perhaps develop a professional flower garden on the extensive property. There is hope of also building a covering above the rail car to protect it from the elements. 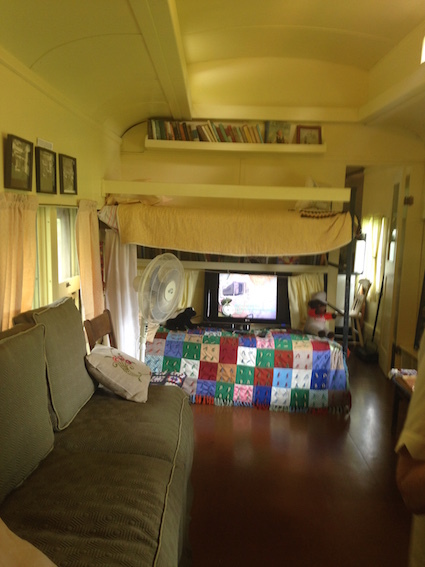 During Tea with Toby, she talked about life on the railcar, which seems quite extraordinary to me, but was just the way it was for her – a young child who didn’t know anything different. She, and her twin brother, William, were the youngest of the Sloman family, which also included older sisters Liz, Margaret and Joan. The children were all taught in the school car by their father until Grade 12. Then, each was boarded in Clinton to attend their 13th year at the Clinton High School in order to prepare them for their post-secondary studies. Toby did take a number of correspondence courses when they became available starting in Grade 10 year, and she recalls complete culture shock while attending Grade 13 in Clinton. As a young woman who loved to spend most of her time in the bushes of Northern Ontario (with her brother) she found it odd that “she wasn’t to speak to the boys” at the school – “protocol” of jealous teen girls at the time. She said she felt like a lone fish. Two sets of bunk beds and a trundle bed that doubled as a sofa made compact living space but room for everyone. The sofa is not the original. The audience asked questions about pets, and the children (they had cats and dogs and at one time a pet skunk, Petunia). I was surprised to discover that the children being taught were mostly of Italian origin as I had expected them to be First Nations. Toby had friends in each community and she feels her family was treated like royalty all along the track. Religion was not a significant part of their weekly rituals but the family did attend the Anglican Church in Clinton during summer breaks. And she talked about her dad as the teacher – he dressed in a shirt and tie, as that was expected of teachers by the Ontario Department of Education. She suspects he was the only person seen to wear a tie by some of the folks in the communities they visited. The Sloman route is shown on the right side of this map. 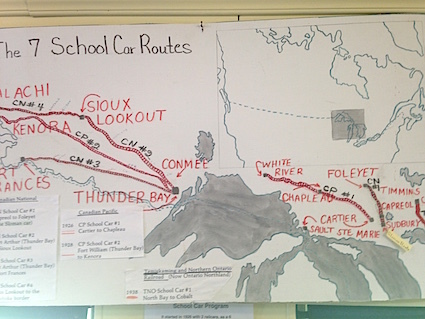 They were part of a system that ran over 4,500 miles of track through Northern Ontario. It’s clear Toby adored her father. She admits she now understands his choices and commitment to this lifestyle was both courageous and extraordinary (when she was younger he was just ‘dad’). There was no television. There was no radio. In the evening Toby remembers men of the community coming to the railcar for poker games. Christmas and Easter were big in each of the communities they visited so the celebrations were a month long. Sometimes movies were shown when the projector was run off a car battery. Personally, Toby read a lot and – to this day – doesn’t remember ever being bored. 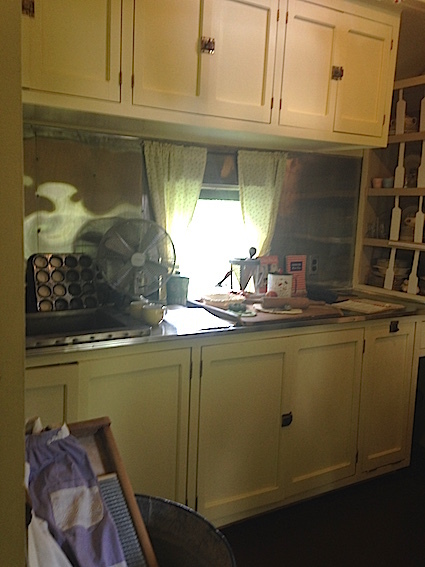 The compact kitchen where Cela Sloman prepared meals for her family of five while travelling the rails in Northern Ontario – every year, for 39 years – from September through June. Imagine how creative she must have been! We talked about arts and culture in the region and the importance of sharing our collective stories. Years ago the Blyth Festival premiered the Sloman’s story in Fires in the Night by Carol Sinclair. I remember opening night when the playwright presented Cela Sloman with a bouquet of flowers. I didn’t think that standing ovation was ever going to end. Toby remembered that too. This heritage museum has educational, railway and historic significance. They host special events and activities. This summer they’re highlighting Games and Toys of the Past including a special day this Saturday – June 20. The Bayfield, Clinton and Vanastra Lions will be hosting a Steak Bingo from 1 p.m. to 2 p.m. and there will be games and a scavenger hunt on the property from 10 a.m. until 2 p.m. Collectors have donated toys and games and the museum will have a special display on site. I highly recommend you gather your children or grandchildren to visit the School on Wheels. You won’t be disappointed. Open: Victoria Day to last weekend in September, Thursday through Sunday and Holiday Mondays 11 a.m. to 4 p.m. Cost: Admission is by Donation.